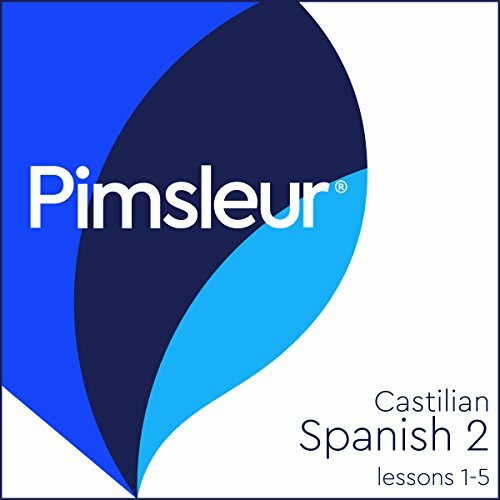 The Pimsleur® Method: the easiest, fastest way to learn a Castilian Spanish. Completely portable, easily downloadable, and lots of fun. You’ll be speaking and understanding in no time flat! This course includes lessons 1-5 from the Castilian Spanish Level 2 program featuring 2.5 hours of language instruction. Each lesson provides 30 minutes of spoken language practice, with an introductory conversation and new vocabulary and structures. Detailed instructions enable you to understand and participate in the conversation. Practice for vocabulary introduced in previous lessons is included in each lesson. The emphasis is on pronunciation and comprehension and on learning to speak Castilian Spanish. A user’g Guide is included. In the United States, the term “Castilian” or “Castilian Spanish” usually refers to the dialect that is the official language of Spain, where it’s used in television and radio broadcasts. It is understood throughout the country, although there are marked regional differences. The difference between Castilian Spanish as spoken in Spain and Spanish as spoken in the Americas (now called Latin American Spanish) is due to the diminishing contact between Spain and the Americas over the centuries and to the influence of local languages in the Americas. These two main variants of Spanish are mutually intelligible; the difference between them is comparable to that between British English and American English. Pimsleur’s Castilian Spanish teaches the official dialect as spoken by the majority of Spanish speakers in Spain. Spanish is the official language of 21 countries and is one of the six official languages of the United Nations. Spanish is the first language of more than 350 million people, more than any other language except Mandarin Chinese. Additionally, Spanish is a common second language - the most studied after English, and the third most commonly used on the Internet after English and Mandarin.